Arsenal is a fictional character, a robot appearing in American comic books published by Marvel Comics. 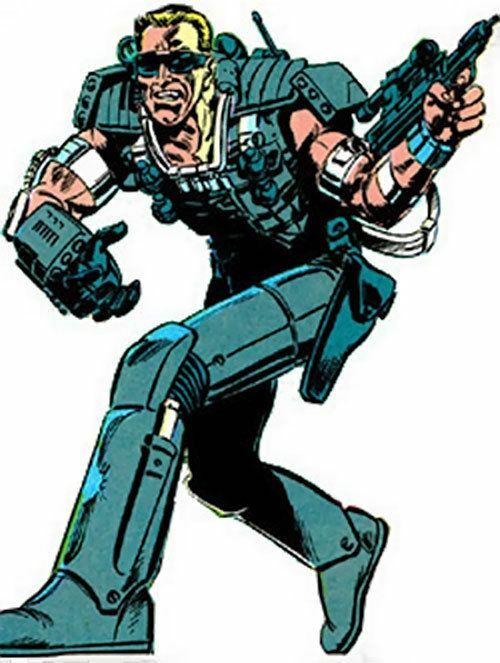 The character first appears in Iron Man #114 (Sep. 1978) and was created by Bill Mantlo and Keith Giffen. 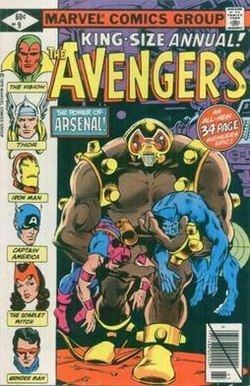 Arsenal first appeared in a two-part storyline in Iron Man #114 (Sept. 1978) and Avengers Annual #9 (1979). 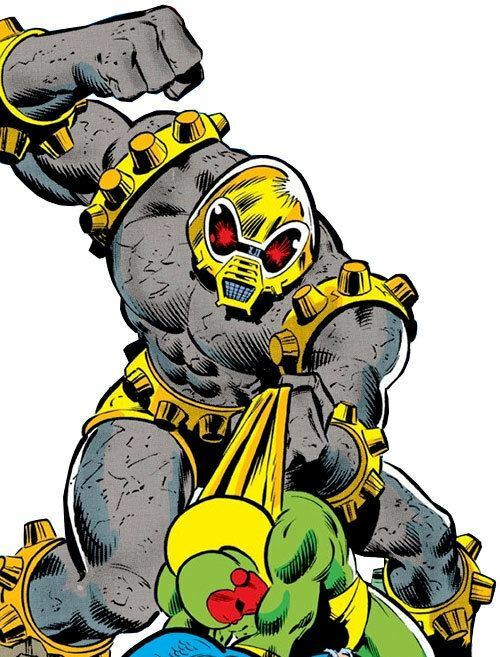 The character made a final appearance in Hulk #282 (April 1983). The Arsenal "Alpha" unit appeared in Iron Man vol. 3, #84-85 (Aug. 2004). In the final days of World War II, a group of Allied scientists led by Howard Stark developed "Project Tomorrow" and the creation of a robot called Arsenal, a prototype fighting unit to be deployed in the event of an Axis victory. The robot was also guided by Howard's early computer program called Mistress. When the Allies won the war, Arsenal was placed in storage. The robot was activated for a military demonstration during a worsening Cold War but was never used. In the present day, the Avengers are battling the Unicorn underneath Avengers Mansion, when Arsenal suddenly appears and attacks the group. However, Iron Man successfully drives Arsenal off. The Avengers learn the robot's origin from the group's government liaison Henry Peter Gyrich. 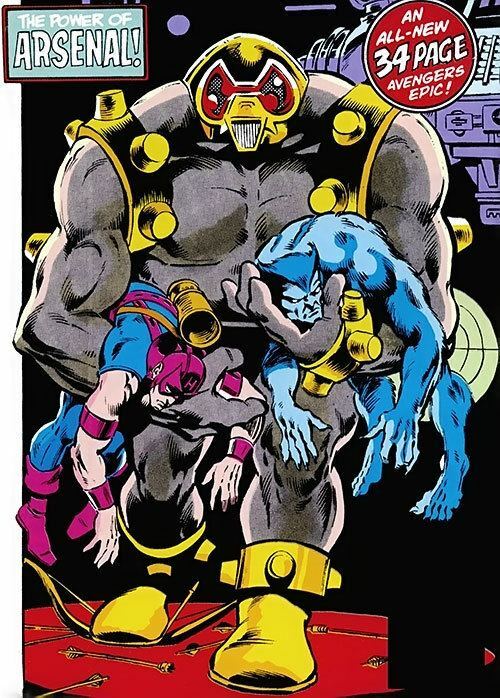 Arsenal reappears and captures Hawkeye and Beast and stuns Yellowjacket with an electric shock. Yellowjacket, however, recovers and alerts the other Avengers, advising the group that Project Tomorrow is directly beneath the mansion. Guided by Mistress erroneously believing the Allies lost World War II, Arsenal defeats several Avengers, until confronted by Thor and Scarlet Witch. On the verge of defeat, Arsenal apparently self-destructs while Iron Man confronts Mistress programmed with Maria Stark's brain patterns. Once Iron Man unmasks and explains that the Allies won the war, and that Mistress is simply modelled after Maria, the computer program wipes its own memory. Arsenal actually faked its own destruction. When She-Hulk and the Hulk visit Avengers mansion, it attacks the Avengers' butler Edwin Jarvis. Arsenal then incapacitates She-Hulk, and enraged Hulk pummels Arsenal until it is destroyed. Iron Man eventually learns that only a "Beta" unit had been destroyed, and that an "Alpha" unit remained deactivated beneath Avengers Mansion. Homeland Security ask him to shut it down without informing the other Avengers due to the security risk it poses. Iron Man tracks the unit, but is unaware that the Avengers have followed. The unit is activated when transmission codes are radioed to Iron Man, which results in a battle between the new Arsenal and the Avengers. Iron Man then realises that Arsenal was activated by interference with its signal, which was set to "inert". Iron Man occupies Arsenal while Warbird stops the source of the interference, causing Arsenal to deactivate. The unit is then dismantled. Fully reassembled and under control, Arsenal is later used as a test for a group of Avengers recruits, under the pretext that it is out of control. Both Arsenal units possess amplified strength and durability. The Beta unit also possesses air jets and inertia darts; can radiate an electro-stun field and project a high-intensity laser beam from its eyes. The Alpha unit possesses a flame-thrower, multiple gun systems and a toxic gas dispenser. The Ultimate Marvel iteration of Arsenal are several robots revealed to be a creation of Howard Stark Senior's Project Tomorrow and go after Iron Man. In Iron Man Noir, the Arsenal robots were created as a Nazi weapon by Baron Zemo (aka Howard Stark after being mind-controlled). Arsenal appears in Avengers Assemble, voiced by Jim Meskimen. Designed by Howard Stark to safely absorb and maintain massive amounts of energy, this version serves as a friend and protector to Iron Man (Tony Stark). 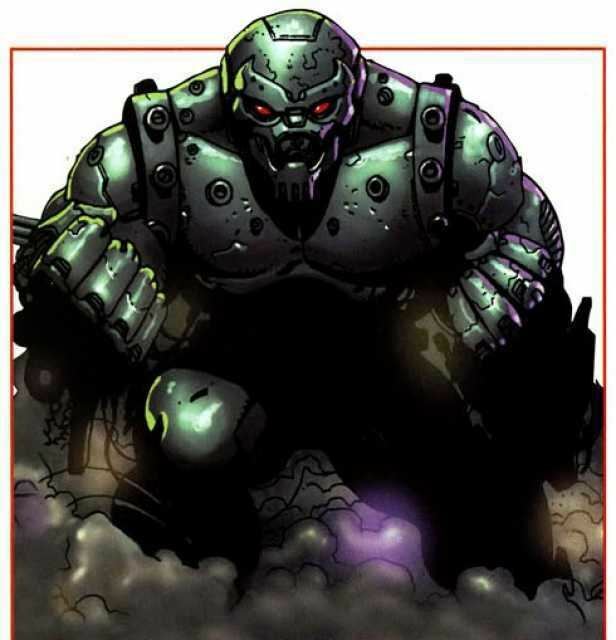 Introduced in "The Arsenal", the android is discovered by Iron Man in an abandoned Russian city where his body has been used to contain a reactor's Gamma radiation for decades until being reactivated with the Power Stone thanks to the Hulk. In the episode "Thanos Rising", Arsenal helps Iron Man against the Grim Reaper. When the Avengers fight against Thanos, Arsenal ultimately sacrifices himself by self-destructing in order to blow Thanos far away from Earth, fulfilling his primary function to protect Tony at all costs. With only Arsenal's head intact, Tony vows to rebuild his father's android (as seen doing so in "Ghosts of the Past" asking for Falcon's help and in "Back to the Learning Hall" where this makes Hawkeye uncomfortable). In the episode "Thanos Triumphant", Arsenal is rebuilt and modified by Tony to absorb all the Infinity Stones' energies, thus helping the Avengers defeat Thanos once again. After Arsenal separates Thanos and the Infinity Gauntlet, Ultron takes over Arsenal's body and absorbs the Infinity Stones to become unstoppable. In the episode "Crack in the System", Iron Man makes reckless mistakes to save Arsenal and even Ultron impersonates Arsenal to get away. In the episode "The Ultron Outbreak", Arsenal briefly regains control of his (and Ultron's) body to say goodbye to Iron Man before once again sacrificing himself by flying into the sun, seemingly getting rid of Ultron in the process.